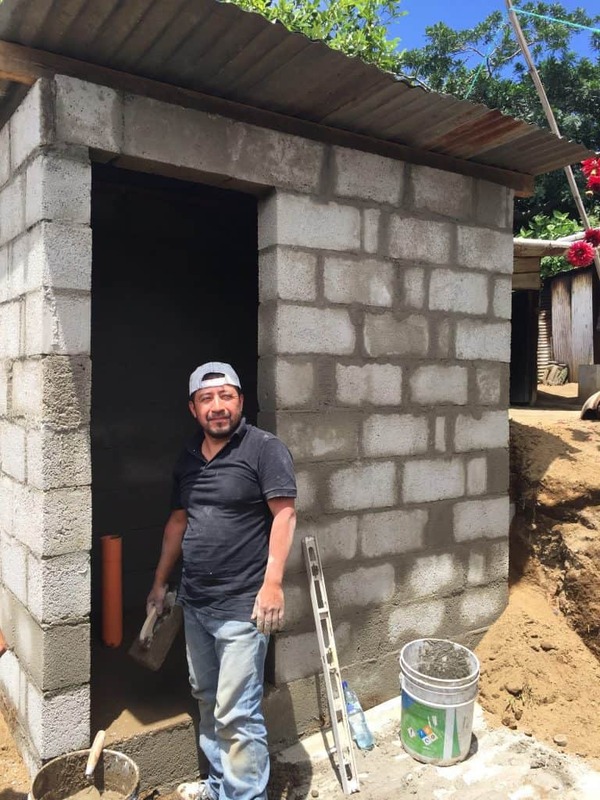 This week, volunteers from Northview Bible Church built a bathroom, complete with a toilet and shower facilities, for an Escuela Integrada family. The family lives high on the hill in San Felipe and previously relied on a neighbor’s bathroom. 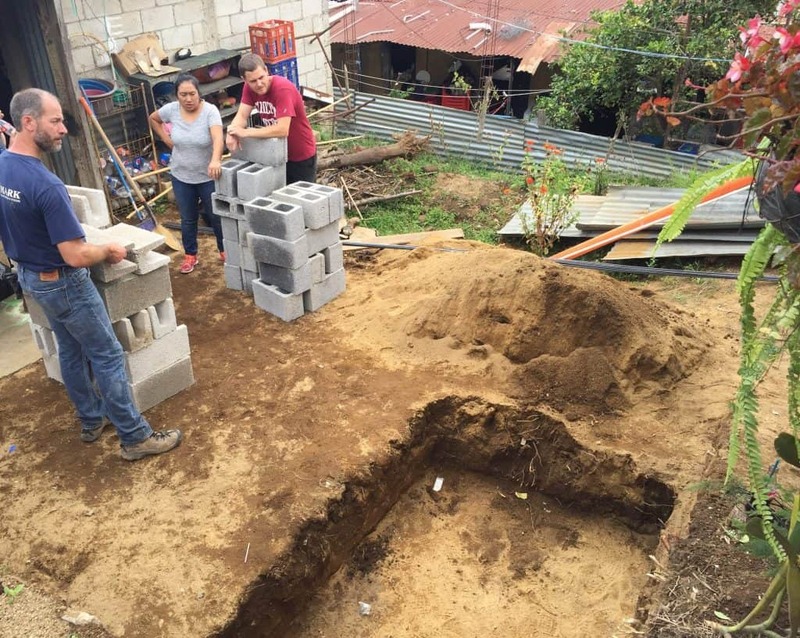 The Northview team, along with local contractor, Carlos, and interpreter, Victorino, built the facility from scratch. They hauled 200 cement bricks, 100 feet of rebar, a couple long plastic pipes, bags of sand and cement mix, and all the necessary tools up a 10 percent grade incline on foot, the small street impossible to access via car or truck. Kendall Noller waits with other volunteers for a delivery of materials at the home of Hermalinda Salama on Monday, July 31, 2017. Behind the two-room cement and laminate house, in the back corner of the yard, a space had been cleared to build the bathroom. The team awaited instruction from the contractor before digging to a depth of 15 centimeters and leveling the soon to be floor. Materials arrived throughout the afternoon on the first and second day of construction. “It makes you see how much we have—in excess of what we need,” said Noller, who used to own a construction business in Washington. The group continued the project for the next four days, working hand-in-hand with Carlos. They were impressed with his skill and ingenuity when it came to various steps of the process. Instead of buying pre-fabricated rebar hooks, he made his own nails, hammered them into a two-by-four in a meticulously crafted pattern, and showed the Northview volunteers how to make their own rebar hooks using the handmade tool. 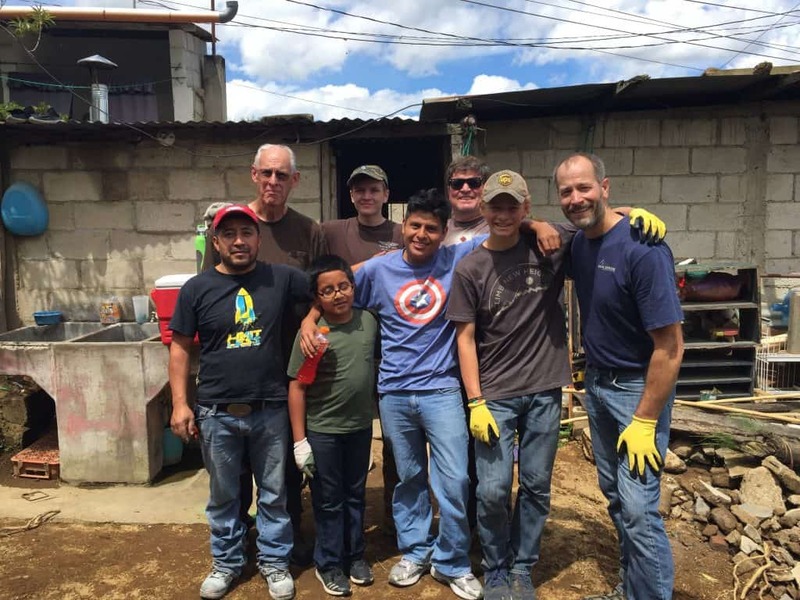 Local contractor Carlos, front left, and interpreter, Victorino, front center, stand with volunteers from Northview Bible Church next to the project site. The group encountered a couple of challenges, mostly the challenge of waiting. They completed one step, then needed to wait for the next load of materials, which at times took an hour or more. While they waited, they visited with Carlos and Victorino, talked about their experiences thus far and took in the sweeping views of the nearby coffee farms built into the sides of the hills. This is the fourth mission trip to Escuela Integrada for Noller and his wife Christy. Their children, Tanner, 15, and Chloe, 13, also came on this trip. Together, they are helping with construction projects and health education workshops at the school this week. Carlos stands next to the nearly complete bathroom on Friday, Aug. 4, 2017. The Northview team finished the bathroom project on Friday, August 4, giving the family a simple, but much appreciated gift. The matron of the house, Hermalinda Salama, has two boys, one of whom is in ninth grade at Escuela Integrada. She lost her husband four years ago and is the sole provider for her family. Until this week, they used the bathroom at Salama’s mother’s house, a single toilet and shower that serves multiple families in the area.